We all have heard stories about how a husband and wife that have been married for many decades die within a short time of one another. In many of these cases, the surviving spouse is in excellent health, yet a few short weeks or months later, they too pass away. It is clear from these cases that many of these surviving spouses literally lose their will to live, which hastens their death. That being said, many people experience loneliness and wonder what the Bible says about overcoming it. Without getting technical, many can certainly agree that loneliness describes the condition that many people experience because they are alone. It may result in sadness, anger, jealousy, or even depression. But one thing is sure: we are made in the image of God and it is in our nature to want to have relationships and interactions with other people. Can’t some people just want to be alone? It is true that some people would rather spend time alone than with other people. However, my experience has been that most people in this situation have reasons that they desire to be alone. In most cases, it may be because they need time away from the hustle and bustle of life to relax and decompress. Some people that I have met that are always on the go and do not take time out to be alone explain that they just do not have the time. However, I point out that even Jesus took time out from the work and stresses of ministry to get away from the people and be alone (Matthew 14:22-25). The problem is when wanting to be alone becomes and ongoing thing at the exclusion of others (Genesis 2:18; Ecclesiastes 4:7-12). What would be a reason that being alone might be a good thing? As I mentioned above, there are reasons that we need time away to be alone like needing time away to relax and decompress. God considers rest to be very important. In the Old Testament, God gave the Sabbath Day as a day of rest (Exodus 20:9-11). In addition to being a day of rest, it had Spiritual significance in that it also represented the rest from our work that we have in Christ through our salvation (Hebrews 4). It was not intended that people should be alone on the Sabbath, but when you consider the reasons God gave for the Sabbath, rest and fellowship with God were part of it (Exodus 20:11; Deuteronomy 5:15). This being said, we may need time alone to devote to prayer and fasting. This is mentioned in the context of marriage in 1 Corinthians 7:5. However, it comes with a warning that it is important that there is a designated ending time so that Satan does not use the time alone as an occasion to tempt us. Likewise, we are told in Matthew 6 that there are times that we should be alone with God to the exclusion of others (Matthew 6:2-6). When can being alone be a problem? As I mentioned before, we were not intended by God to be alone. While there are times that it may be necessary, we need to make sure that there is a designated end time. When we are alone, Satan can use the opportunity to tempt us. In the case of a couple that is experiencing problems, I have seen many times where Satan puts that understanding guy in the wife’s life or a sweet sympathetic woman in the husband’s life as a “friend.” This friend usually tells them everything they want to here and before long it progresses into more. Many marriages have been ruined this way. This is why this advice was even given in the context of prayer and fasting (1 Corinthians 7:5). Likewise, many people choose to be alone because they have been emotionally hurt, abused, and even rejected by others in society. No matter what the reason, being alone subjects the person to thoughts and feelings that spiral into depression. How can we overcome loneliness and help others to over come it? As believers, we are called to love God first and our neighbor as ourselves (Matthew 25:32-40). For this reason, no matter what we are feeling, we must compare it with Scripture to see the roots of those feelings (1). A good reference is Galatians 5:19-26. In Galatians 5:22-23 we see the fruit of the Spirit. We should consider the fruit of the Spirit as green flags when evaluating our feelings and behaviors to determine their source. Do we see our experience as one of love, joy, peace, patience, etc.? If not, what we are experiencing is not founded in the fruit of the Spirit, and it is not of God. In this case, we can look at the works of the flesh listed in Galatians 5:19-21. Things that are not of God should be considered as red flags that warn us that our thinking needs to change so that our feelings and behaviors change. For example, if we are lonely, we are not experiencing joy and peace. Therefore, this should serve as a red flag that we need to do something to change it. We do this by actively engrafting the Word of God and engaging with other believers (Acts 2:42-47; James 1:21-25). Likewise, it is so important that Christians actively esteem others above themselves (Philippians 2:1-8). We do this by humbling ourselves and coming along side of them motivated by love, patience, and understanding (Romans 12:9-16). It is these bonds of fellowship that we can minister to those who are lonely, no matter what the reason (Acts 2:42-47; 2 Corinthians 8:1-7; 1 John 1:1-7). In all things however, it is important that God is at the center of our thinking so that the bonds of loneliness are broken and we can experience the joy and peace that comes from God. For this reason, Christ-centered Biblical counseling is also important in recovery from loneliness. 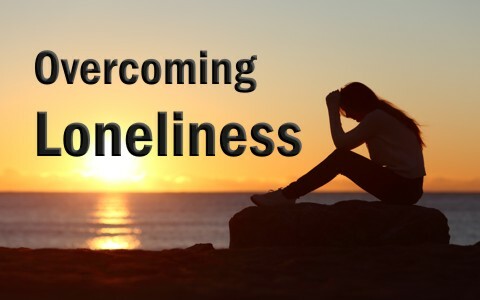 Many people experience loneliness and wonder what the Bible says about overcoming it. Loneliness may result in sadness, anger, jealousy, or even depression. We were not intended by God to be alone because he wants us to have relationships with others that strengthen us and protect us from the influence of Satan. To break free of loneliness we must actively engage God’s Word and fellowship with other believers to change the thoughts and feelings that cause and reinforce loneliness. As believers, we must demonstrate our love of God and our neighbor by ministering to those that are lonely. Resources – Scripture quotations are from The Holy Bible, King James Version. (1) Williams, Michael, (2013). Introduction to Biblical Counseling. Albuquerque, NM: Selah Mountain Bible Institute. Previous post: What Is A Spiritual Awakening?